We found overload of awesomeness, right at the center of Erandwane – Leafy Trails, a charming rooftop book cafe with warm homely vibes. We’re are a team of die-hard bibliophiles, hunting around town for great book cafes for our post-work retreats. 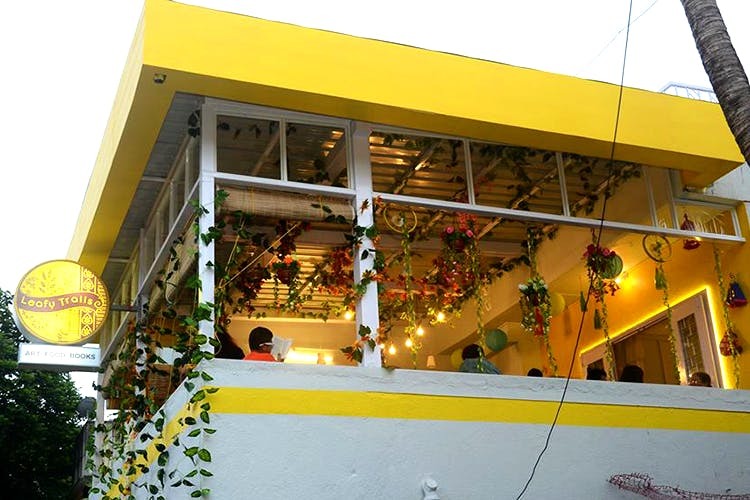 And this time, our search landed us to this beautiful cafe, adorning a refreshing white-and-yellow hue with large windows, scantily wrapped in mossy green climbers. Leafy Trails on Bamboo Lane is one of those Instagram-worthy book cafes in the city! The interiors strike the perfect balance between funky and eco-friendly. The cane curtains, the wooden seating area, the dreamy fairy lights, hanging lanterns, a wall full of vinyl records, the fragrance of those potted plants and the enchanting dreamcatchers make this place worth spending hours with just a cup of masala chai and a great book. Speaking of books, their shelves are well-stocked with good reads across genres, themes and authors. Whether you’re a Nora Roberts fan or a follower of Jack Canfield, Leafy Trails will always have something for you. And in case, they don’t, request the owners for the book you’re looking for and they’ll make it happen for you. Food wise, the place needs to up their game a bit. The menu is simple, full of quick bites, beverages and munchies. We ordered a chicken egg roll for INR 85, a leafy veg cheese sandwich for INR 50 and a cup of tea for INR 20. We wouldn’t say the food was spectacular but it was sober on the palate and satiates your midday hunger pangs. Leafy Trails charges an entry fee of INR 20 per person per hour. However, we think the beautiful ambience, the great books and the courteous service totally make up for everything else. They host a number of workshops, readings and art pop-ups in the cafe. Stay tuned to their events page of Facebook for more update.